Worcester Warriors have announced that winger Chris Pennell has signed a new two-year deal. Worcester born and bred, Pennell represented England at U19 level and became a key performer for the club during the 2008-09 campaign until he suffered a serious knee injury in Europe. The dynamic back has since returned to full fitness, grabbing a tries against Connacht Rugby and Olympus Rugby XV Madrid this season, and has been praised by Director of Rugby Mike Ruddock for his commitment and determination to battle back from injury in recent seasons and continue his development. 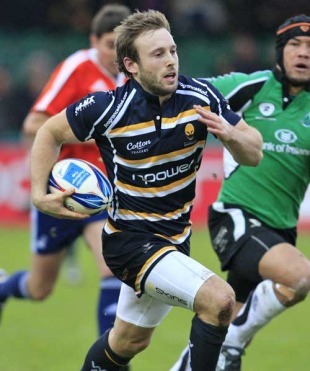 "It's a big boost to us that Chris Pennell has signed for two years," said Ruddock. "He is an outstanding young man with a strong work ethic and high skill level. "He has overcome a number of injuries over the last couple of years and always comes back fitter, stronger and better then he was at the time of the injury. From that point of view, Chris is an inspirational character and I really believe the best is yet to come from him and he has the potential to follow the likes of Matt Mullan, Miles Benjamin and Tom Wood into representative rugby. All Blacks captain Richie McCaw has been nominated for a New Zealand Sportsman of the Year award while Aaron Cruden has been selected as a finalist for the Emerging Talent of the year. Former All Blacks Jonah Lomu and Jeff Wilson have also won the award as most prestigious Sportsman, but it is 45 years since New Zealand rugby claimed the supreme award. The supreme award, referred to as the Halberg award, was last won by the sport when All Black Wilson Whineray claimed it in 1965. It is won by the winners of either the Sportsman of the Year, Sportswoman of the Year, or Team of the Year. Saracens have extended the contracts of the club's entire senior coaching staff. Forwards coaches Alex Sanderson and Paul Gustard have both signed two-year contract extensions, with kicking coach Dan Vickers agreeing a similar deal. First-team coach Mark McCall, formerly of Ulster, and back line coach Andy Farrell are signed up on long-term deals. The Vicarage Road outfit have enjoyed an excellent season to date and are currently lying second in the Guinness Premiership table with just two defeats from 12 league fixtures. Director of Rugby Brendan Venter said, "We are working hard to develop a culture of success at Saracens, and continuity and stability are absolutely critical. So it is magnificent news for everybody that our outstanding young coaching staff have confirmed their commitment to the club. The energy and enthusiasm of this coaching group is fantastic, and I'm delighted we will be staying together for the foreseeable future." Biarritz lock Jerome Thion has been cleared of punching or striking Glasgow's Richie Gray in Sunday's Heineken Cup match. New Zealand 7s coach Gordon Tietjens, whose side lead the series after winning the opening two rounds of the IRB Sevens Series at Dubai and South Africa, has otherwise stuck with tried and trusted players heading into the third round in Wellington. Counties Manukau forward Fritz Lee has been given the chance to display his wares and the 21-year-old joins Counties Manukau team-mates DJ Forbes and Sherwin Stowers in Tietjens' side. "It's always great to play at home and Wellington is a pretty special tournament," siad Tietjens, whose side lost 19-17 to England in last year's final. "The players know there is a little more pressure and expectation than usual, but they want to get out there and really turn it on for the home crowd." New Zealand 7s squad: Kurt Baker (Taranaki), Tomasi Cama (Manawatu), DJ Forbes (Counties Manukau), Paul Grant (Otago), Tim Mikkelson (Waikato), Zar Lawrence (Bay of Plenty), Fritz Lee (Counties Manukau), Lote Raikabula (Manawatu), Ben Souness (Taranaki), Sherwin Stowers (Counties Manukau), Nafi Tuitavake (North Harbour), Save Tokula (Waikato). Bath have announced that rising star Ben Williams has renewed his contract for another two years. The 20-year-old joined the Bath Rugby Academy straight from school and has since worked his way up the ranks to make three first team appearances this season, one of which was in the Guinness Premiership against Worcester Warriors. Skills and Defence Coach Brad Davis believes that there is a lot more to come from Ben and is looking forward to seeing the youngster develop and progress. "Ben is a big, abrasive centre who has good all-round skills. His performances to date have shown a great deal of promise and we are all expecting him to keep on developing as a player."